Aid Doodle Devil in the destruction of everything. You’ve already created a whole Universe from the four basic elements and you don’t know what to do next? Destroy everything to the ground! Discover the seven deadly sins and there will be no coming back for you! Try to combine elements and invent murder, death, demons, beasts, zombies... which will destroy everything. 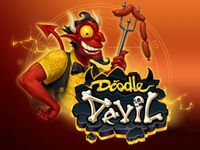 Embrace the world of lust, gluttony, greed and theft to find out what Doodle Devil was doing while Doodle God was busy creating the Universe and life in it.